The wide-open reception area look out over the water. A kitchen this fancy makes you think twice about the basic breakfast cereal. A massive pool and two slides equal countless hours of entertainment. You'll see why Hemingway was so inspired by this island. The beach is bordered by a stream that flows into the ocean. Ancient island rulers knew a gem when they found it, and you’ll quickly see why they sought solitude here at the beachfront Waipouli Beach Resorts & Spa Kauai by Outrigger on the east side amid the black lava rock and lush, tropical grounds. The outdoor heated pool has three waterfalls, a lazy river and two waterslides. There are three hot tubs. The poolside bar and restaurant, Oasis on the Beach, serves up island-themed umbrella drinks and comes to the rescue when your kids’ snack stash runs low. Little ones will love the sand-bottomed wading pool. When it’s time for lunch, take advantage of the poolside bbq grills. Let the little ones help carry burgers, hot dogs and sides and get ready for a fun family cookout. Visit the well-equipped fitness center to get in a workout. Reward yourself for a trip well-planned with a massage, facial or body treatment at the on-site Spa by the Sea. One- to two-bedroom condos sleep four to six guests and offer partial ocean, oceanfront, ocean view, garden or partial mountain views. Full kitchens because sometimes a mini-fridge just doesn’t cut it. Head to Safeway to stock up on groceries. The kids will be begging to help make your famous double chocolate brownies (and be the official taste testers). And freezers are perfect for storing hot pockets, microwave pizza and ice cream. Catch a sitcom rerun on the Flatscreen TV; it has Cable. DVD players are perfect for a low-key night in for family movie night. Bring favorite movies from home, pop some popcorn and call everyone into the living room. Last one on the couch is a rotten egg! Show off your multi-tasking skills and throw a load of laundry in the in-suite washer/dryer while the movie is playing. Now all you have to do when you get home is unpack. Just across the street from Waipouli Beach Resorts & Spa Kauai by Outrigger is a small shopping complex with a Starbucks, perfect for getting your caffeine fix. 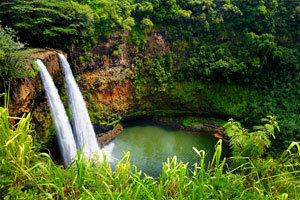 Kauai is known as the “Garden Island.” Kauai is home to the only navigable rivers in Hawaii. The largest is Wailua River, and it can be explored by kayak, canoe or on a boat tour. Wailua River leads to two waterfalls, Opaekaa Falls and Wailua Falls. Snorkel Bob’s Kauai offers snorkeling equipment for rent and will be happy to assist you in planning snorkeling trips. Coconut Marketplace features a variety of unique boutique shops. For apparel, check out By the Sea, Crazy Shirts and Na Koa Surf Co. For souvenirs and gifts, there’s Auntie Lynda’s Treasures, Del Sol Hawaii and Hawaiian Music Store. When its time to eat, head to Bobby V’s Italian Restaurant Pizzeria. - Front Desk is open 7:00 AM - 9:00 PM daily. Guests that arrive late must contact the property in advance using information on the booking confirmation.